During WCF’s 22nd Partnership Meeting in Zurich last October, outgoing chairwoman Anne Alonzo introduced Nicko Debenham, of Armajaro Trading Ltd., as WCF’s new chairman. Nicko assumed office on January 1, 2013, for a two-year term. He is no stranger to WCF, having served as co-vice chairman in 2011-12. In his role as WCF chairman, Nicko is playing a key role in bringing together expertise from the cocoa industry to lead the strategic direction of WCF in the development of cocoa sustainability programs benefiting cocoa farmers and their communities around the world. At Armajaro, Nicko serves as the United Kingdom-based director of development & sustainability. He brings more than 25 years of experience working on cocoa value chains with an emphasis on West African cocoa. He has significant experience in developing and pioneering traceable cocoa systems in coordination with producer country governments, initially in Ghana and now expanding to other producer countries. 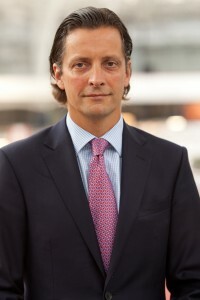 Nicko previously served as head of Africa for the cocoa division at Armajaro Trading Ltd. from 2002 to 2009, before assuming his current responsibilities at the company. He is also the director and chairman of Source Trust and designed the Source Trust model approach to address the needs of smallholder farmers and their families with an emphasis on the farmer as the focal point of all training and services. Nicko oversees and directs all development and sustainability programs for Armajaro and Source Trust globally, including the regions of Asia, Africa, the Americas and the Caribbean. Nicko took some time recently to respond to a few questions for WCF’s Newsletter about his vision for WCF, revealing insights about his expertise in cocoa sustainability, as well as about his personal side. What appealed to you most about the possibility of becoming WCF chairman? The ability to contribute, through a highly respected organization, to the improvement of the lives of cocoa farmers around the world. What is the biggest challenge that you see facing WCF as you assume chairmanship of the organization? I think there are different challenges facing WCF as an organization, as well as its role as a leader in the sector as a whole. WCF has grown and evolved and needs to ensure that its role as a representative of its members is very clearly aligned with its objectives as an organization. In addition, the challenge for WCF is that the whole cocoa sector should look to the WCF as the knowledge centre to guide the sector to achieving the necessary advances in sustainability and productivity to reach required livelihood standards for farmers while ensuring security of supply for the manufacturers. How did you choose to become involved in the cocoa trade and what motivates you to be active in the area of cocoa sustainability? When I became engaged to my wife at 19 years old, I was riding as a steeplechase jockey in America. Her father correctly pointed out to me that I needed to engage in more gainful employment and introduced me to a Nigerian friend of his. I ended up working for the Nigerian company called Ebun Industries for six years. During my time there, I was mainly involved with farmer buying operations and then later with setting up and helping to manage a cocoa processing factory. My experience working with farmers in Nigeria convinced me that the future of cocoa could only be secured through supporting farmers to have acceptable sustainable livelihoods. When your term ends, what would you like for your legacy to be at WCF? I would like my legacy to be that the WCF is considered the leader in knowledge on cocoa sustainability. I believe WCF should be a risk taker when implementing programs so that the lessons learnt can be shared with the entire cocoa community. WCF should set high targets in farmer livelihood improvement through innovation, technology and imaginative thinking. You travel nearly constantly. When you’re not traveling and aren’t at the office, what do like to do to relax? I like to ride horses. My whole family rides together and horses are a major part of our lives. Horses are very therapeutic animals! In West and Central Africa, where the majority of cocoa is grown, women contribute significantly to cocoa production, accounting for nearly 50% of labor on the cocoa farm, with emphasis placed on cocoa nursery management and post-harvest activities. However, despite the significant role that women play in the production of cocoa, they do not benefit to the same degree as men do in the cocoa sector. There are serious gender gaps in development projects in the sector. In research conducted in West and Central Africa in partnership with the Royal Tropical Institute in Amsterdam, WCF found that most outreach projects target cocoa farm managers and owners, who are predominantly male, inadvertently excluding women from participation. Moreover, the financial credit awarded to farmers for important, but costly inputs, are awarded mostly based on farm ownership, but few women farmers own the land they work. Development projects that specifically target women in the cocoa sector directly impact the livelihoods of the household including education (particularly girls’), food security, health and nutrition. Empowerment of women can also lead to a decrease in domestic violence. Moreover, considering their significant role in cocoa production, outreach to women has a direct impact on the health of the cocoa sector. With this in mind, WCF has taken great strides to bridge the gender gap in its West and Central Africa programs with activities, interventions, and innovations that specifically target women farmers. The WCF Empowering Cocoa Households with Opportunities and Educational Solutions (WCF ECHOES) program provides family support scholarships which help a mother entrepreneur in a cocoa community to build her personal business while providing needed funds to send her children to school. 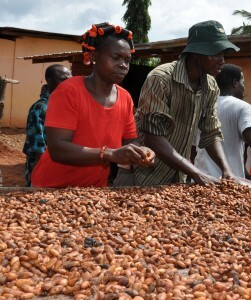 A woman cocoa farmer dries cocoa beans in Oforikrom, Eastern Region, Ghana. The WCF Cocoa Livelihoods Program (WCF CLP) directly targets women in its farmer training outreach by setting quotas for the participation of female farmers, relaxing criteria for participation to accommodate non-landowners, and developing training material that is of greater interest to female farmers, such as pre- and post-harvest activities and food crop production. The program is also developing strategies to improve access to financing specifically for women, such as financial products which incorporate food and cocoa production and the establishment of women savings clubs. Through these new strategies, women would receive training in financial management and develop direct relationships with microfinance institutes. WCF is also integrating technologies it is developing for farmer outreach which directly target women cocoa farmers. The first is the use of low-cost, participatory video technology created by a WCF partner, Digital Green, to carry-out production training in the field. The flexibility of showing training videos, as opposed to traditional bi-weekly farmer field school classes, allows women to participate in the training program around their household responsibilities. Moreover, using local farmers in the video production creates a stronger connection for the participating women farmers, and additionally, the women farmers will be registered into the CocoaLink program, which uses mobile SMS messaging to provide continuous cocoa-related information to farmers via portable phones. Through text messaging, the farmers also maintain communication with professional cocoa extension officers for follow-up support. In 2012, WCF CLP awarded two challenge grants which focus on developing innovations to improve women’s benefits in the cocoa sector. In Liberia, the challenge grant supports the SEKUFA women’s group to develop high quality commercial and marketable black soap and tie-dye from cocoa pod husks. In Cameroon, the grant supports the work of the Institute of Agricultural Research for Development (IRAD) to train women’s groups to produce a soy-chocolate drink, cocoa butter and cocoa powder from cocoa beans and byproducts. Recognizing the critical role that women play in the health of the household and that of the cocoa sector, WCF is continuing to work with its partners to develop new and innovative strategies to bridge the gender gap in cocoa. It would be easy to use this opportunity to look back on our accomplishments in 2012. Without appearing to diminish all that we did over the previous 12 months, I want here to draw your attention to what WCF has planned for 2013. Our ongoing program activities have fully resumed after the holidays and, on January 24, our Accra office hosted its first-ever open house. The event introduced WCF programs in West Africa further to member company representatives and others in Ghana, where coincidentally our newest member, Cocoa Merchants Company Ghana Ltd., is based. The addition of new members to WCF is encouraging in so many ways, not the least of which is the message that it sends about the chocolate/cocoa sector’s seriousness about sustainability. Moving beyond the 100th company member milestone we achieved last year, WCF is eager in 2013 to expand the reach and breadth of companies that share our vision of a more sustainable cocoa sector. This includes not only chocolate companies, but input suppliers, financial institutions, port authorities, and others involved in the cocoa supply chain. In February, I will travel to Asia with Virginia Sopyla to explore program opportunities in Indonesia and Vietnam. 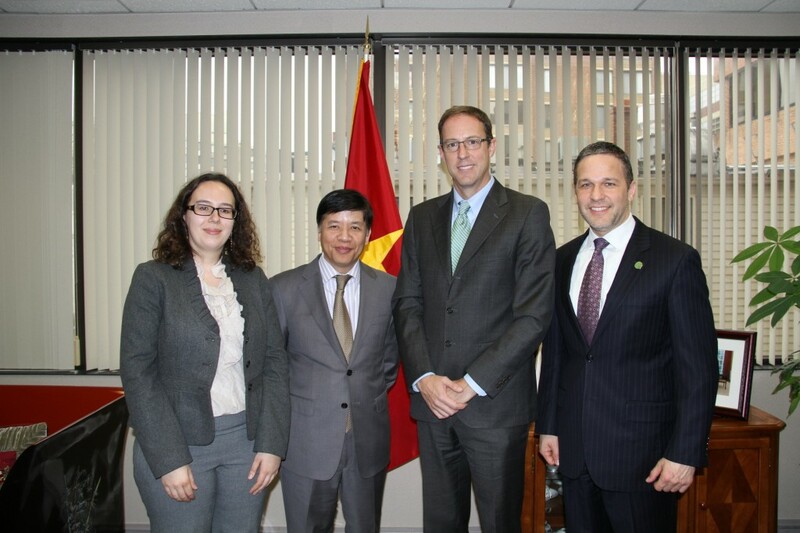 Our time in both countries will be important as this year marks another first-ever, that of a Vietnamese participant in our USDA Cocoa Borlaug scientific research fellowship program. Indonesia also presents a range of options for cocoa sustainability programming. During the same trip, I will be hosted by the Chocolate and Cocoa Association of Japan, which is sponsoring a nearly year-long exhibition about chocolate at the National Museum of Nature and Science in Tokyo. In addition to providing remarks to a public event at the museum, I will take advantage of my time in Japan to meet with WCF member companies based there. Looking further into the year, the major landmarks for WCF are undoubtedly our two Partnership Meetings, the Annual Benefit Gala, and our first-ever trade fair, as well as the steering committee meetings for the WCF African Cocoa Initiative (ACI) and the WCF Cocoa Livelihoods Program (CLP). The first Partnership Meeting in 2013 takes place in Washington, D.C., on June 5-6, with our Third Annual Benefit Gala taking place on the evening of June 5. Last year’s Gala broke new ground in many ways, and I am delighted that we have been able to use funds raised at the event to support IT-based education solutions in cocoa-growing communities in West Africa. This year we hope to garner support for our cocoa exchange programs. The second Partnership Meeting in 2013 takes us to the increasingly interesting Latin America and Caribbean region, with our meeting slated for October 16-17 in Santo Domingo, Dominican Republic. The Dominican Republic is a natural choice as host for the meeting as the country’s profile in fine flavor cocoa is unflagging. During the meeting, we plan to also profile a wide range of cocoa sustainability efforts in other countries in the region, including through the trade fair, which will take place alongside the Partnership Meeting. Of course, none of these activities in 2013 would be possible without the active support and engagement of our member companies. This especially includes WCF/ACI and WCF/CLP, both of which benefit greatly from guidance provided by member companies and others through these programs’ steering committees. Cameroon will play host to the WCF/ACI and WCF/CLP steering committees meetings in early May, with Ghana playing host to the meetings in early October. Since our founding in 2000, it seems that every year has brought exciting new partnership opportunities and an ever fuller slate of activities. Another thing that has not changed is WCF’s mission to improve the lives of cocoa farmers and their families. I know that WCF can count on its partners in 2013 as we continue to make a measurable difference in advancing cocoa sustainability around the world. Thanks to WCF’s Agricultural Logistics Training Program (WCF-ALTP) thirty Ghanaian youth have been equipped with agricultural logistics skills to help qualify them for future employment and to pursue advanced level education, specifically in the cocoa industry. This essential initiative began in June 2011 to develop and build the technical competencies and livelihoods of Ghanaian youth to support the overall advancement of the nation. It also addresses the cocoa industry’s need for a more knowledgeable and skilled work force to drive continued industry success. Beneficiaries, specifically selected from cocoa-growing areas, undertook a four-month intensive class training after which they were given a three-month internship placement in WCF partner organizations. Amongst other things, they had the opportunity to use logistics software for warehousing operations and improved their marketing and human relations skills during the internships. For most participants this has been a motivating opportunity to explore other ways of engaging in and improving the cocoa sector while bettering their own lives. “Had it not been for the course, I don’t know where I would be”, quotes one beneficiary currently working as a Logistics Supervisor. WCF-ALTP is an exciting and encouraging way to improve the lives of the youth from cocoa households. The WCF Ag Logistics Skills Development Program is a two-tiered certificate program designed to equip post secondary and tertiary Ghanaian youth with practical knowledge and technical skills in Logistics, Transportation, Supply Chain, Warehouse, Port Operations, and ICT Management. Program partners include WCF, Kwame Nkrumah University of Science and Technology, ADM and the Ghana Cocoa Board. In a statement released on December 10, 2012, the International Cocoa Initiative (ICI) criticized ‘Shady Chocolate’, a film recently produced in Denmark that focuses on the presence of child labor in the West African cocoa sector. ICI said the film carries a number of errors, fails to capture the reality of the context, offers little insight as to the best means to solve this complex problem, and does not present the full picture on efforts that are being scaled-up to tackle child labor. According to ICI, the film makers only find fault with ICI’s efforts, with no credit given for the substantive work ICI and others, including through WCF’s ECHOES program (n.b. WCF was not interviewed by the film makers), have done in improving the lives of children in West African cocoa growing areas. Commenting on the film, ICI’s Executive Director Nick Weatherill said, “Shady Chocolate is a missed opportunity to paint an accurate picture about the complex realities of child labor in cocoa. It does not analyze the problems and potential solutions, nor does it report on the real progress that has been made to-date, and which should, indeed, be further scaled-up.” For further information on the ICI statement, contact Muriel Guigue at m.guigue@cocoainitiative.org. Tucked away in a remote area of Côte d’Ivoire, nearly two hours away from a main road, is the cocoa farming village of Bieby. Children dressed in school uniforms run and play next to drying cocoa beans, evidence of the laborious work of their parents and neighbors. In the past, many of these children would not receive an education beyond primary school due to their remote location and lack of access to junior and senior high schools. The closest is approximately 16 kilometers away. 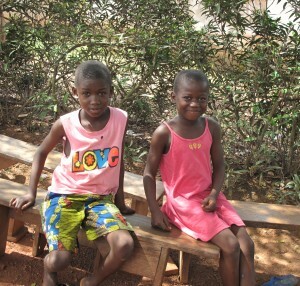 Young children happy about new school in Bieby Village, Cote d’Ivoire. Today, all of that is changing with the completion of construction of the first junior high school in the community, funded entirely by WCF member Fazer, a Finnish confectionary company. In partnership with WCF ECHOES, Fazer donated funding to support the construction of a four classroom junior high school, complete with an administrative block to fill an educational void in the village. The community is buzzing with excitement in anticipation of the inaugural school year as many describe the construction of the junior high school as a dream come true. With the opening of the school quickly approaching, the community has developed a renewed sense of hope for future generations as they watched and participated in the evolution of the construction process, which began in August 2012. In early 2013, the school will finally open its doors to welcome students and teachers alike for the first semester of classes. On the day of the opening, as students are welcomed into their newly furnished classrooms, WCF, Fazer Confectionary and Bieby village will all share in the joy of seeing the youth of this community learning and growing together. 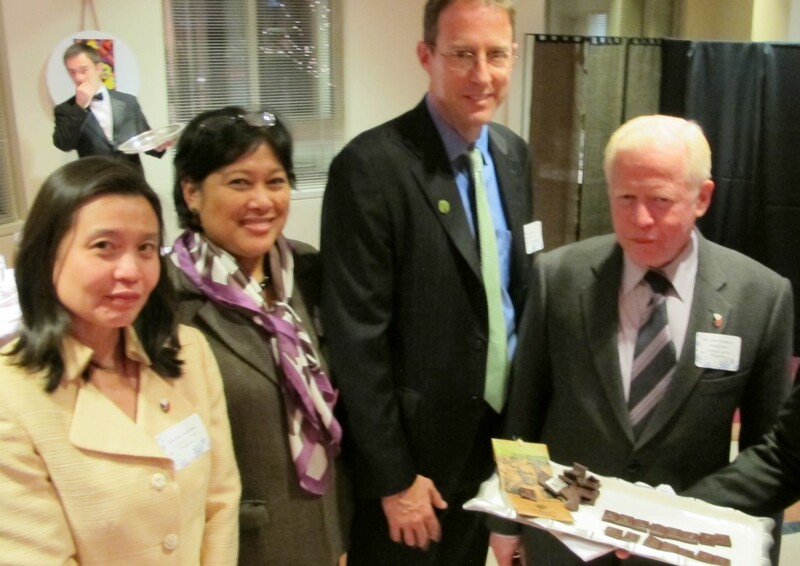 The Embassy of the Philippines in Washington, D.C., hosted WCF’s 2012 Holiday Season Celebration on December 6. Working with WCF member CocoaPhil, WCF supports a mirid control research project in the Philippines and in 2013 will host a Philippine Borlaug Cocoa Research Fellow. Enjoying chocolate made from Philippine cocoa are (L-R) Embassy Agricultural Attaché Joy Javelosa; Commercial Counselor Nini Alvero; WCF President Bill Guyton; and Ambassador José Cuisia, Jr.
With WCF looking forward to holding a Partnership Meeting and Cocoa Sustainability Trade Fair in Santo Domingo, Dominican Republic, on October 16-17, 2013, attention will be focused on the cocoa sector in the Latin America and Caribbean region. 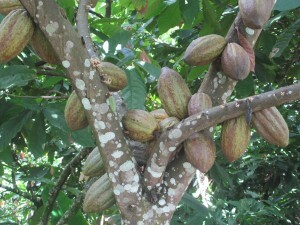 In the Dominican Republic, cocoa is one of the four traditional export crops. Its economic importance is determined by factors such as its role in employment generation, contribution to the country’s Gross Domestic Product, protection of the environment, and the country’s international renown as a source of fine flavor cocoa. According to statistics from the National Commission of Cacao, in 2011 the Dominican Republic exported 65,589 metric tons of organic cocoa, which generated $187 million in profits. Close to 89 percent of these exports met international standards for organic agriculture, and they mostly targeted the European and U.S. markets. Duarte Province, Dominican Republic, is where the greatest amount of organic cocoa is produced in the world. In this province, as well as in the country’s northeast, thousands of acres are dedicated to the cultivation of organic cocoa. The Dominican Republic developed organic cocoa farming in the 1980’s. Planting is done in entirely agro-ecological land, without the use of herbicides or chemical fertilizers. Additionally, semi-processed products are also obtained, such as organic cocoa liquor, cocoa butter, cocoa powder and chocolate. For marketing purposes, Dominican organic cocoa is classified into two types: Hispaniola (fermented) and Sanchez (unfermented). The Sanchez type is produced under natural conditions, from the moment it is harvested until it is dried, and makes up about 70% of the annual Dominican cocoa export. Because of its high butter content and low price, it is preferred by the U.S. market. The Hispaniola type is fermented after harvest and is in high demand in the European market. For export purposes, Dominican organic cocoa is certified by various organizations responsible for verifying and granting a seal that guarantees the cocoa’s organic status and its quality. The Dominican Republic has been included in the select group of 15 countries recognized worldwide as gourmet cocoa producers. Information provided courtesy of the Economic and Trade Section, Embassy of the Dominican Republic, Washington, D.C.
‘Tis the time of the year to make New Year resolutions, most of which have been forgotten by mid-afternoon on Jan. 2. However, here’s a New Year resolution worth keeping — a resolution that is not only worth keeping but is fun to keep: Eat chocolate. 5-6: 23rd WCF Partnership Meeting – Washington, D.C.
22-23: 26th WCF Partnership Meeting – Washington, D.C. Since October 2012, WCF has welcomed Brandt Consolidated Inc., Chocolats Halba, Cocoa Merchants Company Ghana Ltd., and Kellogg Company as new members. As of February 2013, Kirsten Seaver will be director of sustainability at general cocoa company, a division of Coffee America (USA) Corporation. Kirsten joins General Cocoa after 10 years at Mars Global Chocolate. We extend our best wishes to departing WCF staff members Margaret Odotei (WCF/ECHOES – Accra), Issaka Traore (M&E – Accra), and Robert Peck (WCF senior director of operations – D.C.) as they take the next steps in their career paths. We thank Robert for more than nine years of service. Holly Houston, formerly of the WCF/CLP team in D.C., will transition into Robert’s role as director of operations and finance. WCF welcomes new staff member Tehua Koffi (WCF/CCDF – Cote d’Ivoire) and program intern Aron Gunkelman. Of special note, WCF recognizes the retirement of Willy Geeraerts who was a member of the WCF Executive Committee and Board for over eight years, serving as the Barry Callebaut representative who provided strategic direction and guidance to WCF. During this time, WCF expanded programs and formed new alliances, which helped transform the organization from a small, grant-giving foundation to a leading contributor to global cocoa sustainability. Willy also helped WCF to recruit new company members, which today total over 100. His time and dedication to our organization has been greatly appreciated.